Baking bread is a passion of mine. 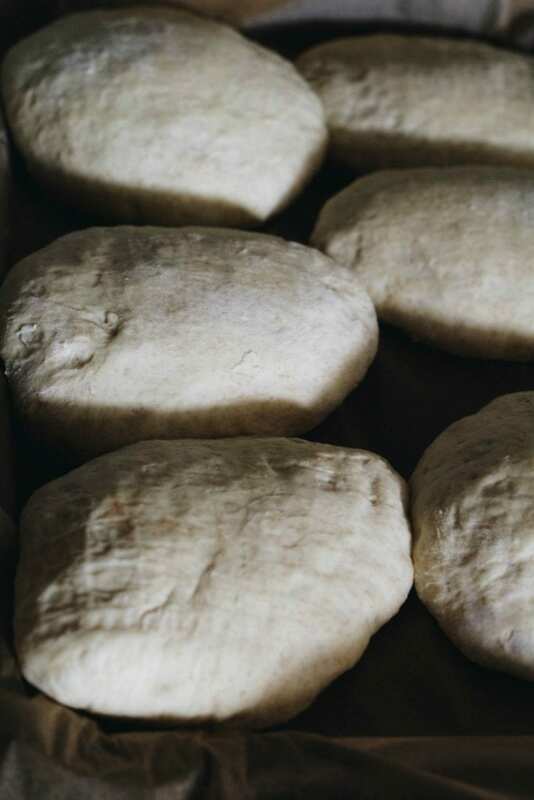 It is so easy to get lost in the process of making the dough and letting the yeast do its magic. This Sourdough Einkorn Bread is a bread that was made over the holiday break and it took a while to get the photos ready to share it here with all of you. I am so excited to share another recipe experimenting with Einkorn flour! 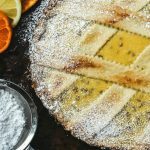 My dear friend Heather from All Roads Lead to the Kitchen and I have teamed up to experiment with einkorn flour and wheat berries. Have you heard of einkorn? When I first heard about einkorn flour, I was intrigued as it’s completely unhybridized and an ancient form of wheat. It was first cultivated approximately 10,000 years ago and is considered a “relic grain”. I first heard about einkorn flour some time ago ready the book Wheat Belly. Einkorn produces much lower yields than modern hybridized wheat. Interest in einkorn has increased as many of its qualities make it more desirable to use than modern wheat. 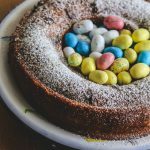 Einkorn grains, berries and flour are used in various food dishes, such as soups, salads, pasta, sauces, breads, cookies, pancakes and waffles, and einkorn flour may be safer to eat than modern wheats for those that are gluten-sensitive. You can read more about einkorn flour on my first post that I did using the flour: Fig and Walnut Einkorn Biscotti. I think that the name einkorn is sort of a funny name for a wheat. I have seen it on Italian blogs also called farina di monococco and also farro piccolo. In German it is einkorn. In French it is le petit épautre and tiphe in Greek. Whatever you call this flour, I just love baking with it. Even the texture is so soft and lovely. The color is different than regular flour. Every time I bake with it, it is a new adventure and I love to see the result. For this bread, I used bread flour and einkorn flour. My mother-in-law did the shaping. She even did a special one just for her favorite nipotino (grandson). We ended up putting the dough to rise on the covered patio was very warm from the afternoon sun. The bowl was not in direct sunlight, but there was enough heat to speed up the process a little. Teresa was intent on having fresh bread ready for when the kids got out of school, and her mission was accomplished. A wonderful and versatile bread dough made with a sourdough starter, bread flour and einkorn flour. The bread can be shaped any way you like it and you could freeze extra loaves and use them as you need throughout the week to have fresh bread any day of the week. In a large bowl, mix together the water and yeast or starter until dissolved and creamy. Add the flours, salt, olive oil and water. Mix until all of the flour is absorbed and you have a sticky dough. Knead for at least 10 minutes or until it’s soft and elastic. Transfer the dough to a bowl that has olive oil rubbed inside of it and cover with plastic wrap. Let the dough rise until doubled in size (about 2 hours). When the dough has risen, generously flour a work surface and transfer the dough to it. Divide the dough into the mini loaves and cover. Let rise for about an hour. Preheat the oven to 425 degrees and bake your bread for about 10 minutes. Lower the oven to 400 F and bake for about another 30 minutes.The bread is done when the internal temperature is at least 200 degrees. Remove it from the oven, let it cool for about 15 minutes, then turn the loaf onto a wire rack and allow to cool completely before slicing. Another time when we made bread and we doubled the recipe, we made some different shapes. The other thing we made was friselle from Puglia. You shape the dough pieces almost like a bagel. When they are baked, you slice them in the middle and bake them more until they are crunchy. You may also see them called freselle, frisedde, fresedde, frise, and are made from durum wheat. some recipe notes: We used the scale to measure the flour and the other ingredients. Many times when Teresa makes her bread, she does without any recipes. But that could be said with many of the recipes that came from her childhood. If you are making this with einkorn flour, remember that you may need to add a little more water or a little more flour. Check the consistency of your dough as you are kneading it and be patient until you achieve the soft and elastic consistency. Naturally cultured foods are sensitive to the humidity and temperature. Our kitchen was about 74 F when we put together this dough. More flour or less water will be needed for the dough if there is high humidity. Also, you should use filtered or bottled water when making a sourdough bread. To prepare and refresh your starter for baking, pour of all but a 1/4 cup of it. You could use the discarded portion for sourdough waffles or even pancakes. Feed the 1/4 cup of starter leftover with 1/2 cup of water and 3/4 cup of flour. 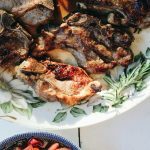 Leave this out at room temperature for 8-12 hours. After 8-12 hours, repeat the procedure of discarding all but 1/4 cup of the starter, and feeding the remaining part with 1/2 cup of filtered water and 3/4 cup of flour (I used bread flour). Leave the starter out at room temperature for another 8 hours. The starter should be ready to use after this fermentation period. If it is not that active and bubbly, repeat the procedure a 3rd time and if needed, a 4th time. You can see my sourdough starter recipe here. I made a sourdough pizza Margherita that was truly amazing! 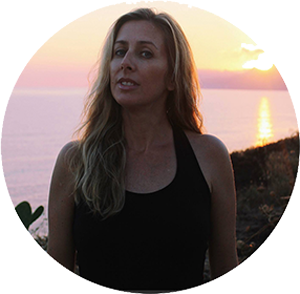 You have to check out Heather’s gorgeous Bacon and Rosemary Einkorn Cornmeal Biscuits on All Roads Lead to the Kitchen. 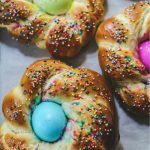 I love the shaping of these, and the thought of your and your mother-in-law making these in the morning, having them ready before the kids get home. I like the idea of using both bread flour and einkorn flour. Lovely Lora! I feel so cozy just reading about the process! You inspired me to make some bread asap! Lovely! Such a cozy bread! I can see my husband and I making these on a slow relaxing sunday and dipping in soup! Lora, lovely loaves! I'm a true wild yeast sourdough baker from way back, and my method is a little different,in that I never discard starter. Please understand, I'm not criticizing your method. 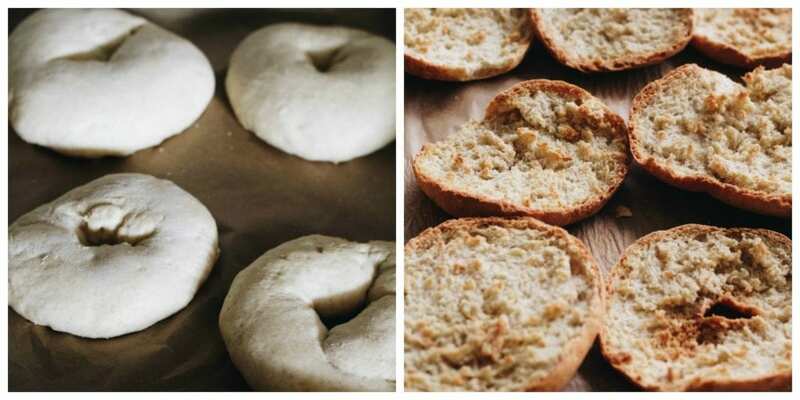 There are soooo many different ways sourdough bakers do things and still have great results, but I'm just mentioning it in case, like me, you are interested in how other people do things differently. 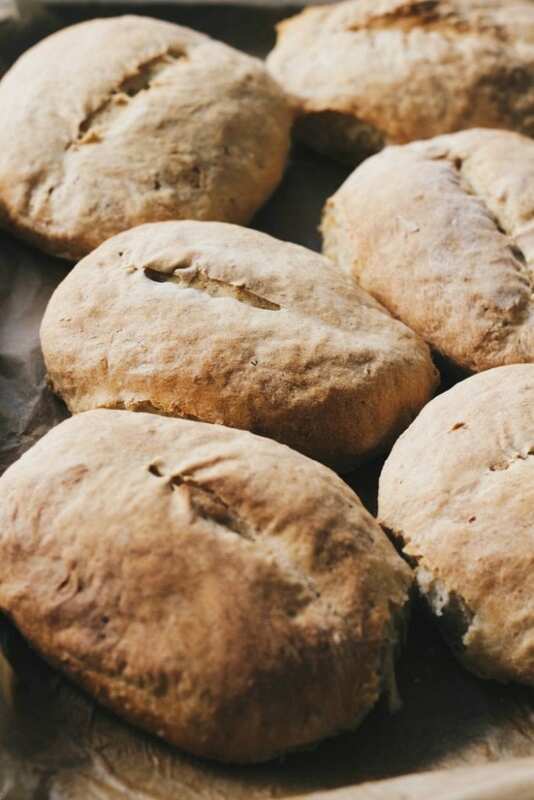 Isn't homemade bread just the best thing ever?! Oh and I love that you are baking with your MIL! How fun! Hi Jean, thanks for your kind comment! Homemade bread is the best! I will check out your site and look for your sourdough recipe to see how you do it!! I love baking and cooking with my MIL…she's amazing!! Love this – I have been wanting to experiment with Einkorn flour and really appreciate the trial and error / details. I haven't had the chance to try Einkorn flour but your recipe has really motivated me to give it a go! Thank you for sharing! How gorgeous is this bread? I've baked with einkorn before, but I haven't been brave enough to try my hand at baking it up into a yeasted bread, let alone a sourdough! I love that you and your mother-in-law baked these up together. Such a wonderful story. 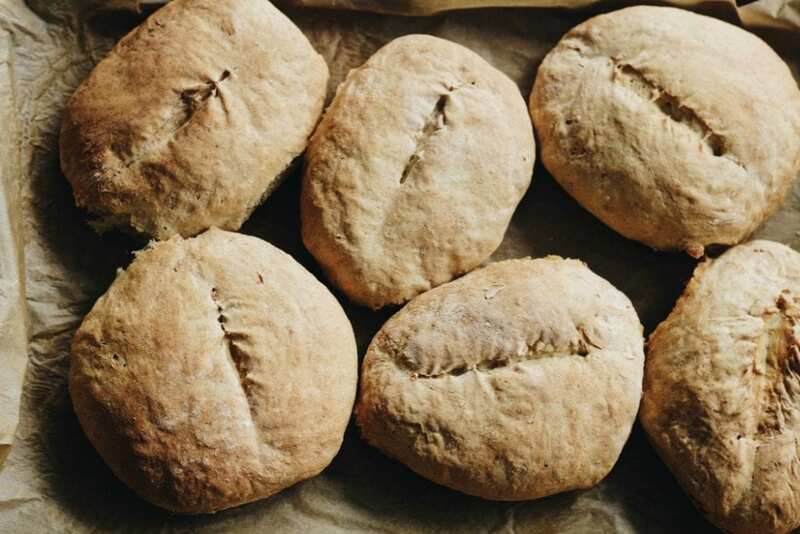 Homemade bread and rolls are pure comfort food! These look perfect! Now I just need to go find some einkorn flour because I have to try it. 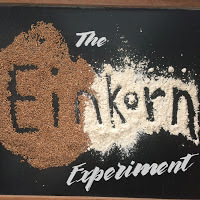 I had not heard about einkorn flour until I read about it on Heather's blog! I need to find some so I can try this! I love homemade bread! I love to eat it and I love how it makes my house smell! It looks lovely! 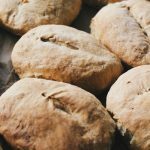 I've never made my own bread… can you believe it?! I'll trade you in olive oil cake though. Deal? I have never heard of einkorn flour before! This bread looks awesome though! I've used 100% einkorn flour and 24 hour ferment of the dough (rather than 2 hours) – results in a very light dough – nice holes. I have to try with 100% einkorn flour. Thanks for sharing!! It's so much fun to experiment with einkorn.